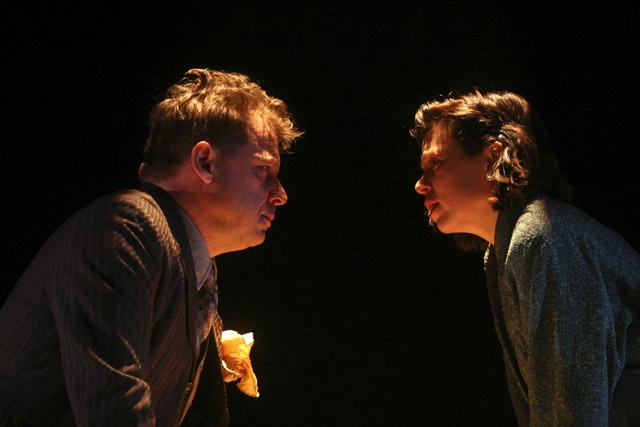 Photo from Eternal Hydra courtesy of Crow’s Theatre. THEATRE: Director Chris Abraham and playwright Anton Piatgorsky reunite after more than five years for the world premiere of Eternal Hydra. A play about identity politics and the myth of artistic genius, it examines the controversy surrounding the authorship of a long-lost manuscript, believed to be the work of an iconoclastic writer. The Crow’s Theatre production features some of Toronto’s most celebrated actors, including David Ferry and Liisa Repo-Martell. Buddies in Bad Times Theatre (12 Alexander Street), preview at 8 p.m., $15. FILM: The Found Footage Festival is a touring showcase of odd, outrageous, stupid, and hilarious clips from videos found in obscure corners of the country. Retrieving abandoned videotapes from garage sales, thrift stores, warehouses, and dumpsters, curators Joe Pickett and Nick Prueher compiled more than an hour’s worth of footage for a unique viewing experience tonight. They will be providing commentary throughout. Bloor Cinema (506 Bloor Street West), 7 p.m., $15. PERFORMANCE: In celebration of Asian Heritage Month and Global Love Day, Toronto-based artist Kate Hollett and choreographer Andrea Nann present the premiere of I Love You More… The interactive video installation, accompanied by a dance piece from the Canadian Children’s Dance Theatre, examines love in the twenty-first century. Exploring new ways to create meaningful connections, the performance also probes the boundaries between the public and the private, the shared and the secret. 509 Dance (509 Parliament Street), installation open to the public from 12–5 p.m., live performances at 1 p.m., 2:30 p.m., 4 p.m., P.W.Y.C. WALK: ROMwalks continues today with a tour of the Danforth area. Highlights include the Prince Edward Viaduct (the stretch over the Don Valley is more commonly known as the Bloor Street Viaduct), Danforth Music Hall, Riverdale Park, Owen Staples House, and several early-twentieth-century churches. There will also be a stop at the Playter Farmhouse, where some of the earliest settlers in Toronto lived in the late eighteenth century. Meet at the corner of Danforth Avenue and Cambridge Avenue, 2 p.m., FREE. ART: Wyoming-based photographer Susan Moldenhauer’s solo exhibit continues at Brayham Contemporary Art Gallery in conjunction with CONTACT photography festival. Mind | Place | Spirit marks her return to black and white photography, wherein Moldenhauer captures the movement of fabric against the backdrop of the American West. In her approach to landscape photography, she goes beyond a physical environment to focus on the individual’s perception of a place. Brayham Contemporary Art Gallery (1318 Queen Street East), 10–5 p.m., FREE.